You can use the Veeam Backup & Replication console to restore a Veeam Agent computer as a Hyper-V VM in your virtualization environment. For instant recovery to a Hyper-V VM, you can use Veeam Agent backups created on the Veeam backup repository. You cannot perform this operation with Veeam Agent backups created on the Veeam Cloud Connect repository. You cannot recover a EFI-based Veeam Agent computer that runs Windows 7, Windows Sever 2008 or Windows Server 2008 R2 to a Hyper-V VM. These OSes can be restored only to a Generation 1 VM that does not support EFI. To learn more, see this Microsoft KB article. Make sure that the target host has enough resources for a new VM. Otherwise, your VM will reduce the target host performance. Veeam Agent computer disks are recovered as dynamically expanding virtual disks. By default, Veeam Backup & Replication automatically powers on a VM after restore. If you do not want to power on a VM after restore, you can change this setting during the instant VM recovery configuration process. The procedure of instant recovery for a Veeam Agent computer practically does not differ from the same procedure for a VM. 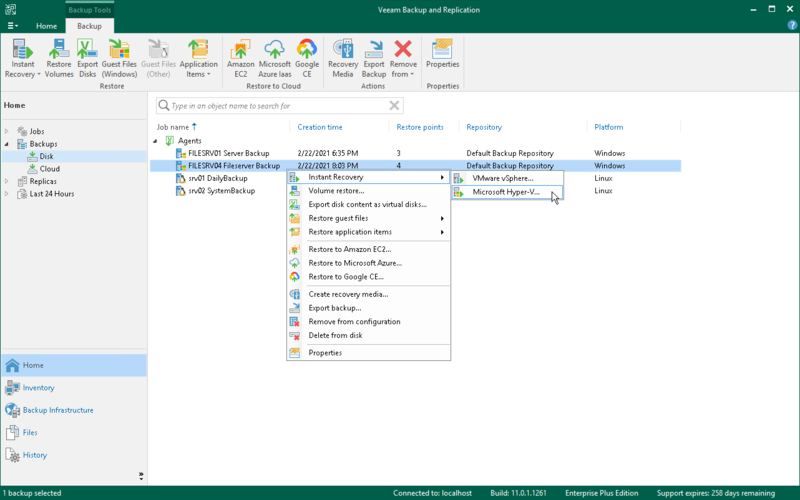 The main difference from instant VM recovery is that you do not need to select the recovery mode, because Veeam Agent computers are always restored to a new location. To learn more about instant VM recovery, see the Instant VM Recovery section in the Veeam Backup & Replication User Guide.